The Toyota 4Runner is an old-school, body-on-frame SUV, not a crossover like its kin the Highlander. It's in the fifth year of its generation, unchanged since 2016, although for 2018 three new colors are available, along with new wheels for the TRD Offroad and TRD Pro models. Its only engine is a smooth 4.0-liter V6 making 270 horsepower and 278 pound-feet of torque that makes it quick, and a five-speed automatic transmission, which feels like enough gears if you haven't driven the eight- and nine- and ten-speeds, many of which offer problematic shifting anyhow. The 4Runner drives better than a truck this size should. It's even easy to maneuver in parking lots. It's comfortable for long hours, with a fairly smooth ride and very little road noise. Inside, it's less refined than the Ford Explorer or Dodge Durango, two main competitors that, unlike the 4Runner, are unit-body crossovers. 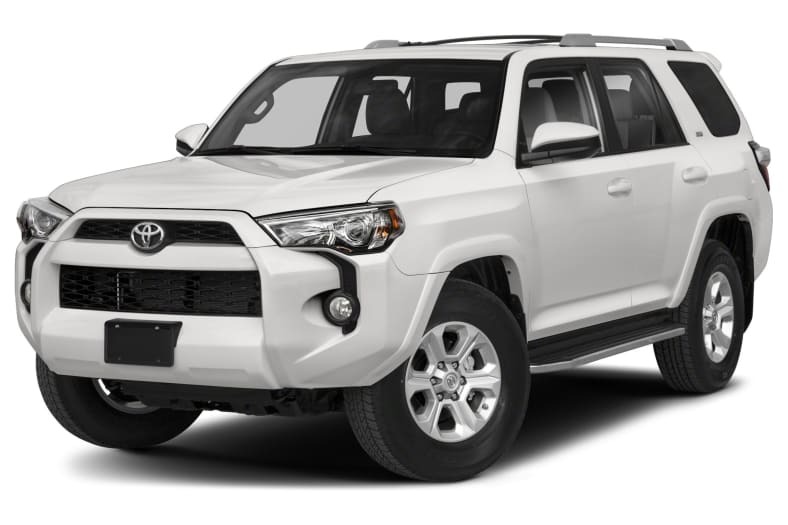 Because the 4Runner's bolted-on body is narrower and its floor higher, we would have expected less cargo space than in a same-sized crossover, but somehow the 4Runner provides 90 cubic feet with the second row folded. The TRD Off Road and TRD Pro Series models only come with 4WD. The TRD Pro is serious, with Bilstein shocks having remote reservoirs, Nitto all-terrain tires, TRD front springs, skid plates, exclusive wheels, and TRD trim and badging. The ruggedness of the 4Runner chassis makes it much better equipped than any car-based crossover to hold up to regular driving along primitive two-tracks, boulder-stream river banks, and other rugged terrain. Eight airbags are standard. The 4Runner scores well in crash testing, but does not always achieve the top rating in each test by NHTSA and IIHS. The base SR5 model with rear-wheel-drive is EPA rated at 17 miles per gallon City, 22 Highway, and 19 Combined. With four-wheel drive it gets 1 mpg less.